This is a short story from the author of "The Toothache Man" and 80's horror classics "Child's Play" and "The Power." Sal's first full length novel in over 20 years, "The Secrets of Love and Death," is due out summer 2015. A free excerpt of the new book is available when you download "The Toothache Man." Sal Conte is the horror writing alter-ego of bestselling author, E. Van Lowe. I get a 'Children of the Corn' feel when I read it. Which I have actually done twice now, and each time it's as scary as the last. These little girls wouldn't appear to be the nightmare that they are, and sadly, someone finds that out. These girls don't even do anything violent, but can make others' do things. What these girls do is incredible. Though, if I had the power they had, I'd use it for the greater good. 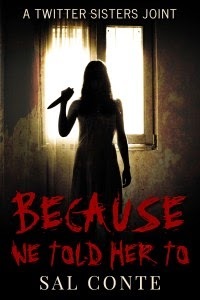 I prefer a horror story and the author delivers there. No swearing or violence needed to get the job done either, which was refreshing. A thrill of a ride for 15 pages. Love short stories and the comparison to Children of the Corn has me curious. Thanks for the heads up! I usually never read horror but I'm so curious! This one really caught my eye- I love that it can be creepy still without the violence. Adding this one to my to-reads!